(Price per Unit Instead of £39.60. You save £1.98 due to the online discount . For short-term warnings around your site, portable and collapsible warning stands are the ideal solution. If the surface of the warning stand is neutral, you can also use them for a variety of different occasions. On a company site, there are areas that need to be pointed out to pedestrians and visitors for safety reasons. Mobile warning stands with reflectors help you to quickly and reliably identify such areas. 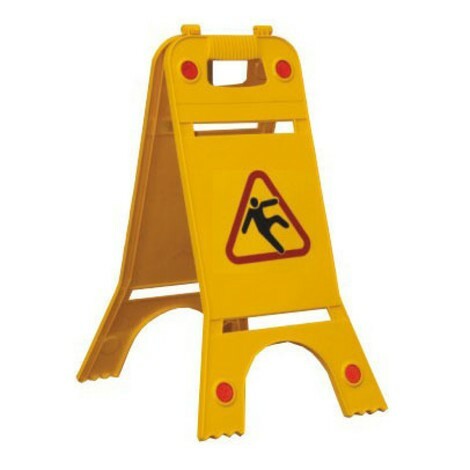 The warning stand is made of polypropylene polycarbonate, which is characterised by its durable and weather-resistant properties. It can be used in both very high and very low outside temperatures and you can rely on its durability under all conditions. The dimensions are 245 mm in width and 620 mm in height. The yellow signal colour and the reflectors ensure that the warning stand can be seen optimally from great distances and also from vehicles. The low weight, the practical handle, and the fact that the stand is collapsible, make it a flexible aid, which will serve you well in everyday operations. If you wish to quickly and easily identify hazards in the future, you can buy the practical warning stands from our shop.